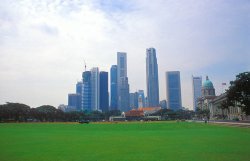 Singapore is a small island. Given a decent road bike, you can cycle around the island in just a few hours! Road cycling in Singaporeis great because the roads are of very high quality. While cycling is not allowed on the expressways, it is allowed on all other types of roads. Singapore lacks mountains but has a good mix of short sharp hills, rolling country and flat land. Cycling paths link many parts of the island and bikes can be rented in many public parks, notably those at East Coast Park, Sentosa, Pasir Ris and Bishan. Mountain or dirt biking is particularly popular in Pulau Ubin. However, city biking is basically non existing in Singapore and the city is not really friendly toward cyclists.